Not Evil Just Wrong Vancouver Premiere – On the big screen! Great news for all our readers here in Vancouver, BC! Global warming alarmists want everyone to believe that humans are killing the planet. But Not Evil Just Wrong proves that the only threats to America (and the rest of the world) are the flawed science and sky-is-falling rhetoric of Al Gore and his allies in environmental extremism. The planet is cooling, not warming. Extreme weather is lower now than ever before. Carbon dioxide is greening the planet, not killing it. Environmental campaigns are threatening the world’s poorest people, and threatening our own freedoms and liberty. We’ve managed to arrange an exclusive screening of this important film at Vancouver’s famous Hollywood Theatre for the premiere night! This theatre is a stones throw away from our headquarters in the heart of Vancouver’s Kitsilano neighbourhood and only a few minutes away from the University of British Columbia. Thanks to generous help from the Fraser Institute and the film’s producers, we will be presenting the feature documentary on the big screen at exactly 5PM on October 18th. Hundreds of thousands of people all around the world will be watching the film in community centers, churches, cinemas, universities, and in their homes, all pressing play on their DVD players at the same moment on October 18th. We will be attempting to break a world record for the largest simultaneous film premiere in history! UPDATE: Greenpeace co-founder Patrick Moore (who appears in the film and is now very critical of Greenpeace) will be attending this premiere in Vancouver, along with producers Phelim McAleer and Barton Sidles! Join the fightback against global warming hysteria and environmental extremism. Please join us at the screening! If you have any questions simply contact us. Who’s invited: You, your family, your friends, people who’ll absolutely love and people who’ll absolutely hate the documentary and therefore must see it. > CLICK HERE FOR MORE INFORMATION ABOUT THE FILM! As supremely awesome as this news is, WE NEED THIS IN MORE THEATRES!! Where can I get a list of all the public screenings?? 2009-2010 will be remembered as the years when the green backlashing finally began. And people everywhere will finally wake up to the climate hoax. Are you pre-selling tickets to this event? Can you post pricing information? It will be totally free, and it's first-come first-serve. See you there! The environmental movement has killed more people than terrorism ever has. And if they get their way, we'll all be living in huts without electricity and no cars, etc. What a scary thought. Thank the lord for this movie and the large awakening currently taking place! The movie should be called "EVIL AND WRONG" though. Because nothing is more evil than Mr Gore and Greenpeace policies. "Let's just kill off all the poor people. Look, those are developing countries. But they can't develop to their full potentials because assholes like us want to block them from using cheap energy. Those countries can't even afford food and we expect them to use expensive and inefficient green technologies?﻿ Yup, that's right"
Environmentalists make me sick. I'll be at the movie premiere and already ordered my DVD copy too! UPDATE: Producer Phelim McAleer, Barton Sidles, and ex-Greenpeacer Patrick Moore (who appears in the film) will all be attending this premiere in Vancouver! Come out for some Q & A's and show your support! All the environmentalist wackos aren't going to be happy until we are all lighting our rooms with eco-safe candles, hewing our letters into recycled stone tablets and riding genetically engineered no-emission donkeys to work. I really can't believe that ANYONE still believes in climate change caused by us little human beings. Thank you so very much for getting the word out to millions of people. I'm a school teacher and this film will be shown to as many of my students as possible. I just met with the head of my sons' school's science dept to urge them to stop showing An Inconvenient Truth to the students. The science teachers and admin refuse to believe anything other humans and CO2 are causing global warming and ruining the environment. I feel I'm butting my head against the wall! Any advice?? Susan, I feel your pain. 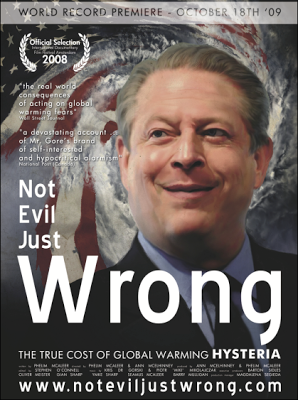 My 12 year old daughter is being force fed the Al Gore propaganda in her school as well, even though Gore's film has been shot down by a supreme court judge as having severe flaws. It's nothing short of indoctrination of our children and is a major reason I'm considering home schooling now. I'm trying to get a viewing of Not Evil at the school too, and I've found support from one of the faculty members who also believes children should hear both sides of the debate. Kids having nightmares about their "carbon footprints" is astounding. It's completely unacceptable. Our liberal run school system ought to be ashamed. It's staggering how stupid each of you are. Read a book. Hey Will, why don't you read a book or two yourself? Start with THIS ONE. Next Next post: When Did Energy Become the Enemy?